Discussion in 'Pictures & Videos' started by Grosen, Jul 13, 2018. Hey All Looking to make a decision on a color for my teak carpet order, if you have a 320 with the teak carpet please post some photos if you can. Thanks! Bridog, Jon Paul, Bk124tt and 2 others like this. It is looking really great. Where did you purchase the teak carpet? It looks terrific! Gary, Quint4 distributes and installs the flooring. And, as evidenced by his pictures and personal experience, does outstanding work! I tried to google Quint4 bout the flooring but it doesn't come up. Can you give me a little more information? These look fantastic! Are they like carpets and fit into the existing space? I will grab some pics of my 2003 320 tonight and post them. I did infinity flooring. I used the original carpets as templates and extended them a bit so they went to the edges (I hated the gaps). I also joined the aft piece to the piece that runs from the fridge to the cabin door making the main floor one piece (gap elimination as well). I like it for the most part but search my post about the foaming bubbles. That situation has not improved with age. This is Corinthian aquaweave. I like it but i didn’t know quint was an Infinity dealer or I probably would have went through him. For what it’s worth I have never had foaming. It’s been in theboat almost 2 years now and looks perfect. Gary B and Bridog like this. I’ve had the foaming issue but it seems to be getting better. Looks terrific! 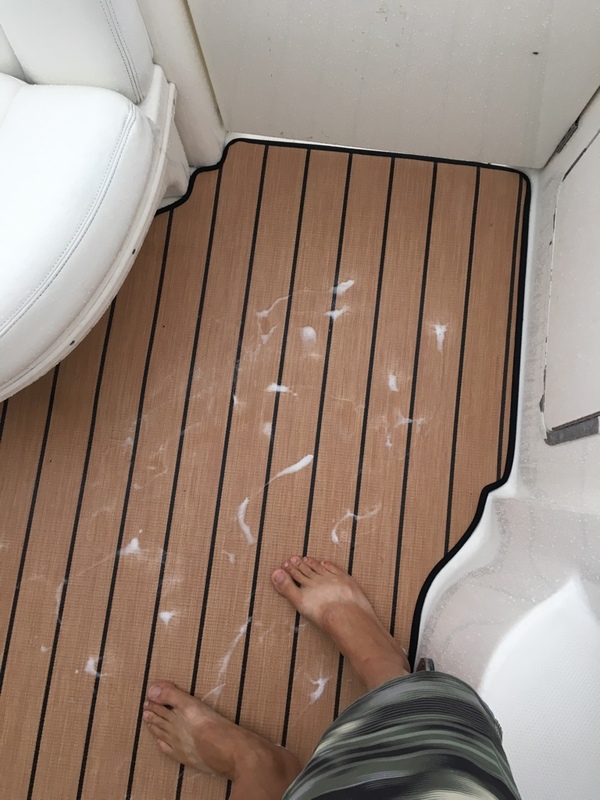 We are planning on ordering the same teak weave to replace our current cockpit carpeting. Thank you for sharing the pictures as they “sealed the deal” for us to purchase the teak look weave. Mine also has been in the boat a couple years (Corinthian Aquaweave) and have also not seen it foam yet. It has been caught in a couple of downpours so not like it hasn't been exposed to the elements.